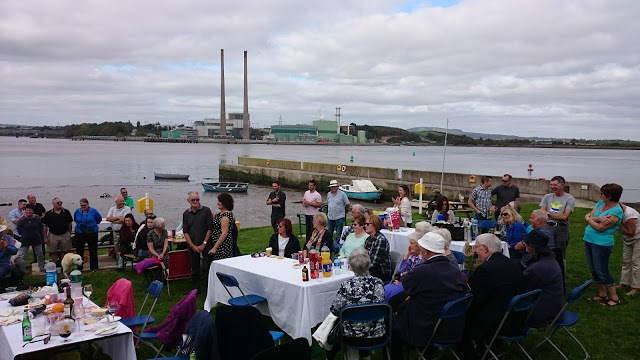 We celebrated the Waterford Harvest Festival recently which had a significant input from the local Grow it Yourself GIY project. Its a philosophy that I have subscribed to with my wife Deena for many years, and I have my grandmothers generation to thank for that. 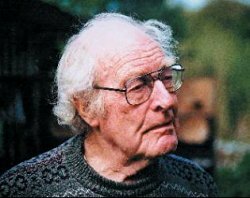 But another influence was John Seymour (1914-2004) who has been called the “Godfather of Self Sufficiency” and was the author of the “Bible of Self Sufficiency”. What many apparently didn’t know, was that he lived locally here in the harbour. 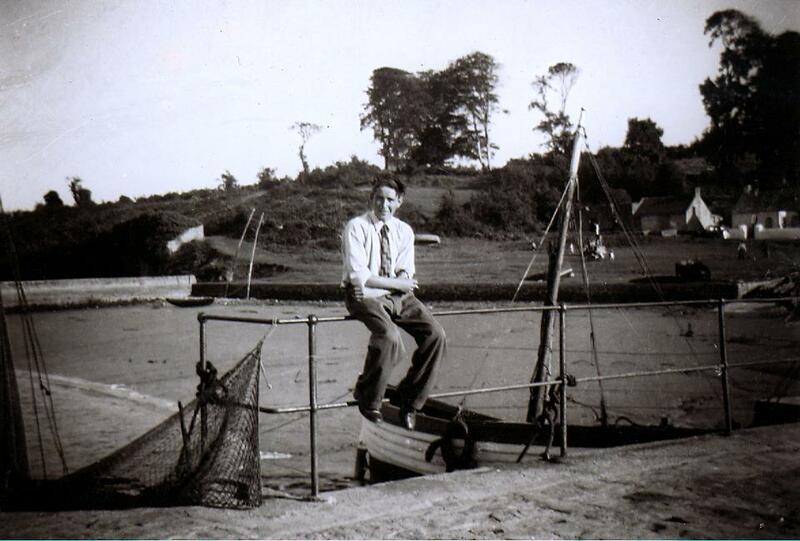 My first introduction to John was as a teenager standing on Cheekpoint Quay with my Father in autumn time. We stood watching as a Prong approached from Great Island. It was skillfully handled and because of such expertise, it gracefully entered the harbour in the village. 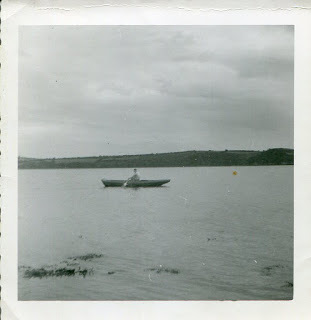 My father went forward to take the bow line, which was thrown from out of the Prong, and up onto the quay popped an older man, but how old I could not guess. He had a craggy face, tufty white hair with a flat cap covering a balded dome and a mischievous twinkle in his eye. “How are you Bob?” was his first words, and although he nodded towards me by way of a hello, he paid no interest in me but continued a wide ranging chat with my father on his spuds, the weather, local fishing and international shipping. I always marveled at my fathers ability to match anyone for discussion on a topic. It was the first book of his that I read, and I’ve read a few since. (A full list here) If I was to try and capture the essence of what he had to say it was probably that you need to live in harmony with nature, and turn it to being your ally in the way you work. Something that is as true for fishing as it is for farming. There were some concepts that I didn’t like, for example he seemed to take a hard line with children in the garden, no messing about, which I would find to be essential. But even if you didn’t like the concept, or the have any interest in the practices, the book itself is remarkable for the images and drawings used, and for capturing a way of life that is now almost extinct. In 1999, in a direct action response to the growing of genetically modified sugar beet in Wexford, John led a protest against a Monsanto product being trialed in fields near to his home. It was the first of a number of actions. When challenged in court he shrugged his shoulders, tilted his head and quipped – “t’was the fairy’s your honour”. Somehow, I don’t think I’d get away with that defense. My knowledge of him, his books and the events with Monsanto was yet to come. As we walked to the top of the quay, Seymour headed towards the Suir Inn for a pint and I think he was disappointed we couldn’t join him. Once alone I asked my father the inevitable question, to which my father simply replied “a Brit living the good life”. On further prying they had met whilst sinking a weir up the Barrow and Seymour had rowed across to ask about the process. Walking home that evening what I had yet to realise was that by Seymours terms, we were already living the good life. In many ways including growing our own potatoes and veg, catching and eating our own fish, able to freely gather driftwood to keep the home fires burning. I would come to live through times that would see that all turned on its head. When as a country we would know the price of everything and the value of nothing. I can only speculate that Seymore came here because he could sense that the life he thought possible, still existed in Waterford harbour. In fighting Monsanto he showed his resolve to try and protect his adopted country. Too bad, those who were born and reared here could not have done likewise. I publish a blog each Friday. 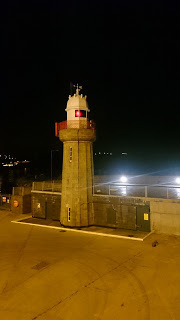 If you like this piece or have an interest in the local history or maritime heritage of Waterford harbour and environs you can email me at russianside@gmail.com to receive the blog every week. it was a weekend the village will surely remember for many years to come. the day went as follows. question. “I do of course” “Are you looking for a berth?, sit down here, ye need look no further” came the welcome response. As a young sailor the now Captain, was part of a crew on an Atlantic run. connected to the ship via some of the rigging. emerged, his determination showing no ceasing. crew hauled their saviour aboard. could have the first choice. As far as I’m aware they had 6 children. 2 girls, Eily and Bessie and 4 boys; Liam, Larry, Jimmy and Christy. 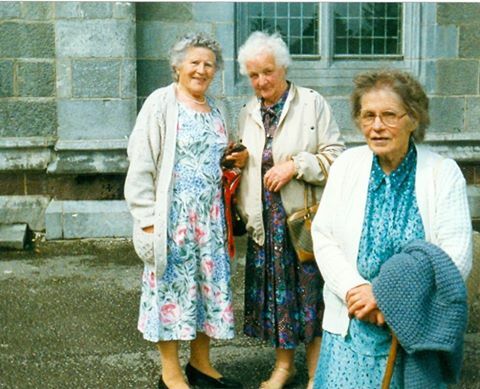 Eily and Bessie lived locally. Larry died aboard ship in the Indian Ocean in 1950. Jimmy, who anyone in the area will know was a crewman on our beloved Portlairge, also went to sea. Jimmy was passing through the Panama Canal one day when he spotted his fathers ship coming against him. He sang out to inquire if Larry Condon was aboard, that it was his son was asking. A deckhand was seen running and moments later his father arrived at the ships side. They had a brief chat to catch up, both walking towards the stern no doubt, to maintain this fleeting encounter. They hadn’t seen each other in two years, and it would be another year before they actually met each other in Cheekpoint. fish seemed to have abandoned us. children at the time) at home. Christy was set up in the job by his brother Laim. Liam had come in from a cold, wet and fruitless night of fishing with my grandfather in 1946 and spotted an advertisement in a local paper for a new engineering firm British Timken in Northampton. He was interviewed in a hotel in Waterford and was given the job on the spot, He was foreman by the fifties and he helped Christy find his feet in the same company, and with the job he kept the family fed and earned enough to put a deposit on a home. it was for the family, it’s often those that are left behind that perhaps feel it more. loved it, could not have come as they’re gone to their eternal rest. in the last number of years, searching for the very same. My thanks to Larry Condon, Pat Condon and Anthony Rogers and his sister Rosalind in compiling this article. All errors & omissions are my own. In 1932, a Hungarian sea captain, Rudolph Udvardy, who was master of the MV Honved,was in the port of Waterford with a cargo of Maize. To free up berth space, the Honved dropped down to Cheekpoint, where she anchored while the ship waited for an outgoing cargo. (Following the Market crash there was a shipping slump, and ships struggled to find cargo) Captain Udvardy was already ill when entering port. So he continued to receive medical attention when at anchor off the Russsianside, Cheekpoint. 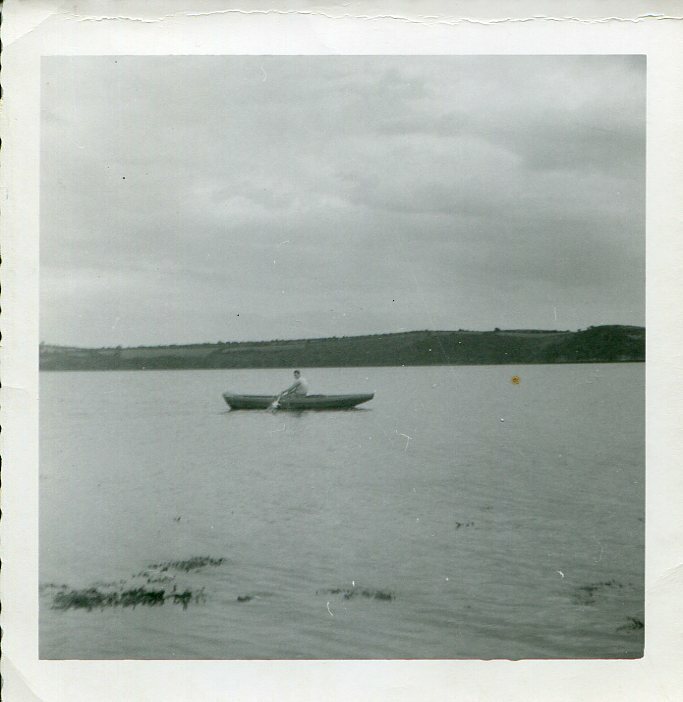 The doctor traveled over from Dunmore East, and was regularly rowed out from Moran’s poles to the ship by my Grandmothers brothers, who also waited to return him to shore. Alas, the Captain died on Friday 2nd September 1932. And he was removed next day to Faithlegg on a beautiful sunny afternoon. Later that night the chapel-woman went to lock the church door. As she was about to close it out she noticed a silhouette near to the altar. Moving slightly closer she could hear a low mumbling sound. Terrified, she turned on her heals and ran to her home – The lodge at Faithlegg gates. There she explained what she had witnessed to her husband and another man who was there playing cards. There was a lot of talk about the devil coming for the captain, there was a lot of winking amongst the men too. They agreed to accompany her back to the church. Strolling in, they had a light step, but this froze at the back of the church when they too heard sounds. More cautious now, they scooped up some holy water and began to inch forward, splashing it as they went, hoping t’wud be enough to keep any evil away. In the darkness nothing could be seen, but as they inched forward, the mumbling could be discerned to words, strange and foreign words. Panic was rising amongst the three and the holy water was being splashed with abandon when one of them stumbled and emitted a cry. All went silent, no mumbling could be heard, and then a whisper came from the area where the Captains coffin stood. Someone was asking who was there, in broken English and in a strange tongue, but human undoubtedly. Moving forward the protectors of the Captains coffin were confronted with the Arab crew, They did not understand the Christian custom of leaving the coffin on its own in the Church overnight. Their custom, they explained, was to remain. The chapel was left open that night and next morning the Captain’s body was committed to foreign soil. 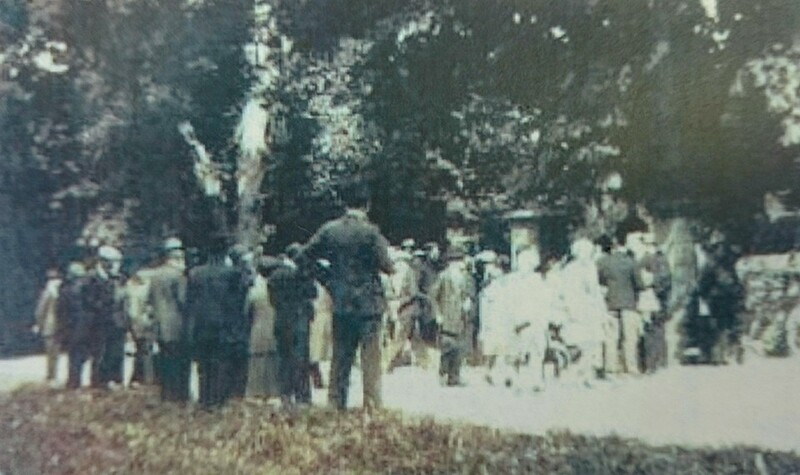 The grave was surrounded by his officers and crew. And there was a huge turnout from the area, a turnout as befitted a sailor who died so far away from his family, something well known to the village of Cheekpoint. The ship remained for a few more weeks, and finally with a new Captain sailed out the harbour. His wife would later sent a small plant in a pot, asking that it be planted to mark her husbands grave. She need not have worried however. His grave was originally marked by a very distinctive metal plaque (John Sullivan could tell me that this was made by Jimmy Shanahan (RIP)) and when this finally disintegrated, a local benefactor provided the headstone that now marks his last resting place. 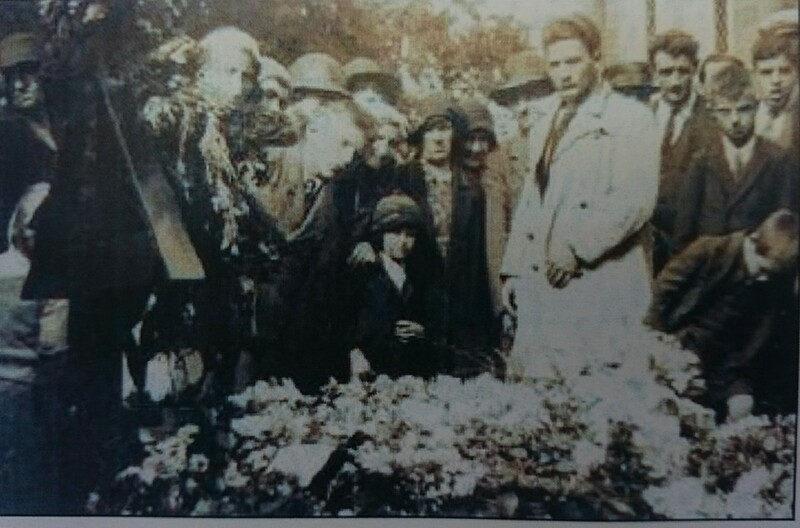 Flowers still appear on the grave from time to time, A reflection of how deep the connection to the events that autumn in 1932 went. 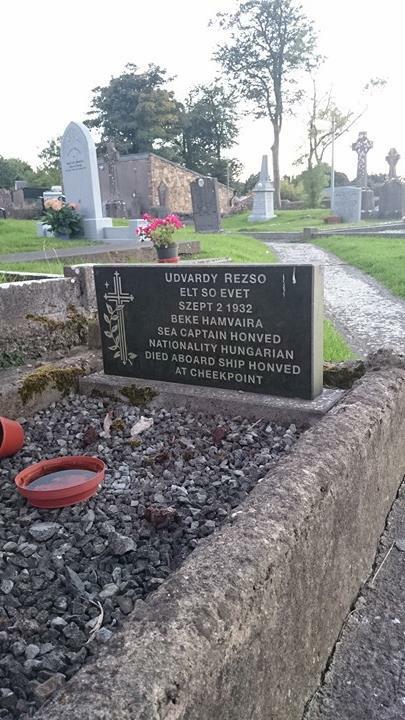 Udvardy Rezso: Elt So Evet, Szept 2 1932. Beke Hamvaria. 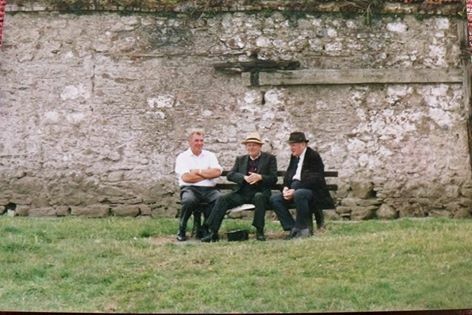 Photo credit: I took copies of the three photos above from an article by John O’Connor in the Munster Express a few years back. My grandmother had a full set of photos, as did many others in the village, but these are no longer at home. 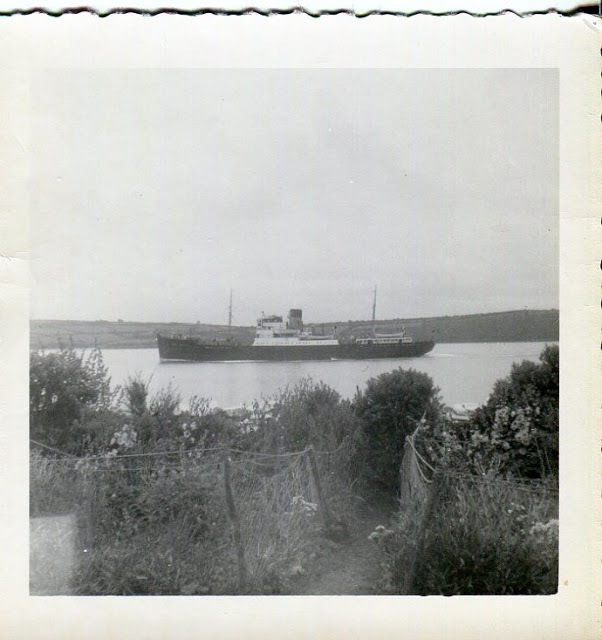 One of the ships officers had a camera and took several photos in the village at the time. He made several copies and posted them back, I’m guessing in some token of appreciation for the kindness shown. Dunmore (Dun Mhor, the big fort) has probably always been a fishing village, or at least those who landed up there, took part of their food supply from the waters thereabouts. But its first harbour development of any merit was the work to facilitate the Mail Packet Station. The Packets as they were called, (because mail in those days tended to be bulky packages of official correspondence) had been in use since Tudor times but the Waterford run was unofficial and thus an unreliable service. 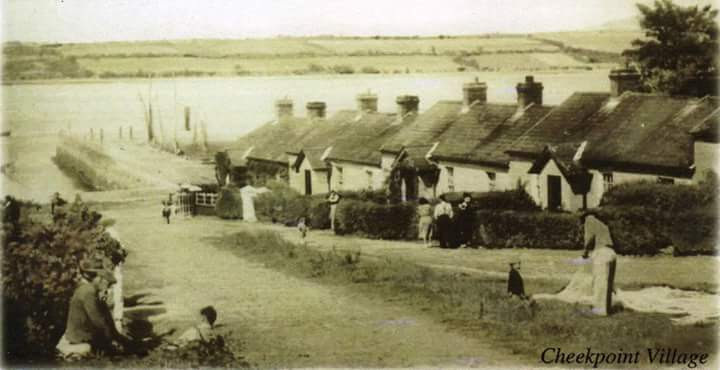 The official Mail Packet Station was established at Cheekpoint in 1787. The service utilised small fast cutters which sailed between the harbour and Milford Haven and carried mail, freight and passengers. Seven ships worked a 6 day sailing schedule. But the location at Cheekpoint led to complaints, as having sailed from England the boats had to negotiate strong tides and were at the mercy of contrary winds. In 1813 the service was moved to Passage East as an interim measure but plans were already afoot to create a purpose built pier at Dunmore East to facilitate the packets. Under the exacting eye of Alexander Nimmo (1783-1832) work commenced at Dunmore in 1814 and the packets started sailing from there in 1818 (sources differ on this). However the lighthouse seems to have been an afterthought and a temporary light was installed whilst Nimmo set to work on what was his first and, from what I have read, only such building. Work commenced about 1820 and was completed by 1824 and became operational in 1825.
stands 16 meters tall including the lantern. Initially the tower was whitewashed, but thankfully this was discontinued over a century ago. beautiful, the cast iron lattice balcony also deserves attention. This is of forged steel and is one of only two such examples in the country, but apparently follows the practice of other Scottish lighthouse builders like Robert Stevenson. The lantern is constructed of metal with square windows and a weather vane completes it. miles. It was initially fueled by oil lamps and reflectors but this was replaced by acetylene in 1922 and it was electrified in 1964 using batteries and since 1981 it’s run off mains power, with a back up generator. 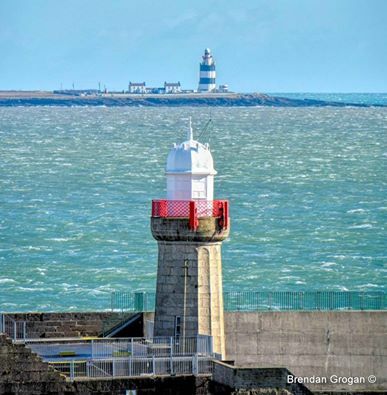 In 1824 there was a report that the lighthouse keeper and his family were living locally because the accommodation at the tower was uninhabitable due to damp. I’m unsure if this was at the tower itself, or in the square building that makes up what I always heard called the storehouse; the flat roofed building that is built around the seaward side. The lighthouse keeper position was removed in 1922 and was replaced by an attendant. 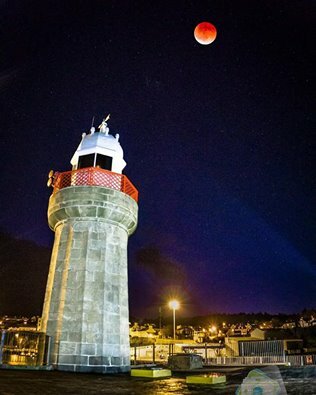 Although Dunmore pier and lighthouse was built to accommodate the Mail Packet, the irony was that by 1824 steam powered vessels were already in use on the route. As a consequence of the ability of such ships to journey against the tides and winds, campaigning began to move the packet once more, this time to the city and this occurred in 1835. Dunmore reverted back into a fishing harbour and in Victorian times a tourist destination. and a testament to the vision and craftsmanship of Nimmo and his team. Local photographers such as Jamie Malone and Brendan Grogan appreciate it. The Barony of Gaultier Historical Society use it on their Facebook page as a cover photo. And the Buildings of Ireland think highly of it too. So if you havn’t already done so, next time you get a chance take a stroll along the breakwater and take a closer look. Antell. R. The mails between South West Wales and Southern Ireland: The Milford-Waterford packet 1600-1850. 2011. Welsh Philatelic Society. 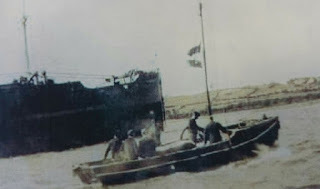 On the 1st September 1942, the SS Irish Willow rounded Hook Head and steamed for Dunmore East. 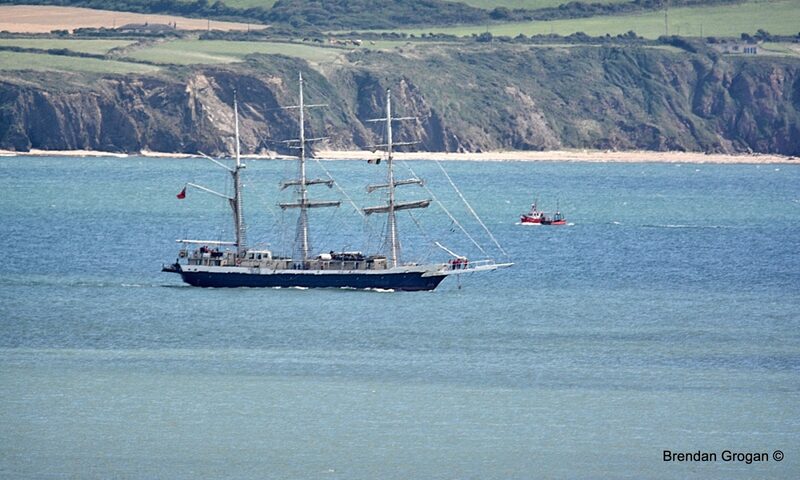 With her destination being Waterford port, it was a familiar course. But rather than being met by the pilot boat, this time she was intercepted by the the local life boat Annie Blanche–Smith. For not alone had she a cargo of wheat for Halls, she also had 47 souls clutched from the Atlantic, the crew of the torpedoed SS Empire Breeze. The Irish Willow (1941-46) was originally built in America in 1917 as part of that country’s emergency fleet expansion to cope with WWI. 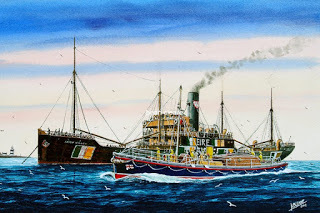 In 1941 she was chartered to the newly founded Irish Shipping Co., in an attempt to keep supply lines open to Ireland. 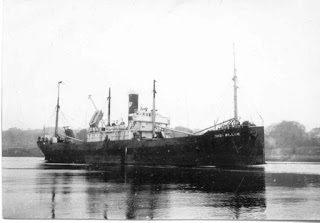 She had departed Cork in June and via Wales for bunkers had taken on a cargo of wheat at St Johns NB and was enroute to Waterford. The Empire Breeze departed Liverpool on August 15th as part of convoy ON 122. On August 25th the convoy was attacked by German U Boats and both U-176 and U-438 fired torpedoes in the direction of the Empire Breeze. It was later clarified that U-176 fired the fatal shots, the other sub’s missile having missed their target. The crew took to the lifeboats and rowed away from their stricken ship, but not before an SOS was sent. However the rules about stopping in convoy were well understood by her crew and as a dense fog fell, they were left on their own in the middle of the Atlantic. Two ships did try to locate them, but the fog was too dense and they were passed off. When the Empire Breeze was spotted still afloat, it was decided to return and temporarily board her from where hot drinks and extra supplies were sourced and a further distress call sent. Picked up by the SS Irish Willow, they immediately responded. However, the decision was not without a lot of risk to the neutral vessel. They had a fix on the ship using dead recoking, in other words they knew the direction the men were in, but not the distance. In a situation of thick dense fog, by travelling too fast they could collide with the stricken ship and risk their own. They could also risk colliding with the life boats. But they also risked the arrival of another U Boat, determined to finish off the job. As they sailed towards the survivors, all these thoughts must have been with the crew. Those not on watch were posted on deck as extra lookouts, and every two minutes whistles were blown as a signal to the stricken sailors. Eventually the wreck site was reached and the men rescued, and the Irish Willow made the crew as comfortable as possible, while making haste towards home. 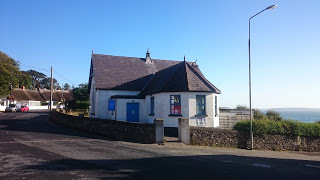 A message was sent forward to alert the Irish government of the situation and the local Red Cross began to make preparations at the Fisherman’s Hall in Dunmore East. A reception centre was set up with food, clothing, beds and medicines. At 1.30pm the Annie Blanche–Smith put to sea, with doctors and ambulance men on board to meet up with the Irish Willow. In two trips the life boat landed the 47 survivors and returned to her station at 3.45pm. * Two of the wounded were transferred to the Waterford City & County Infirmary. Apparently, coal was in so short a supply in the country at this stage, that the trains were no longer running. As a consequence, Sean Lemass Minister (Minister for Supplies) had to authorise two buses to be dispatched to bring the crew to Dublin. ** I’m sure from there they were returned to England, and just like my story of Pat Hanlon, were back at sea within days. The SS Irish Willow continued to Waterford where she was discharged, and continued to keep the country fed for the rest of the war. 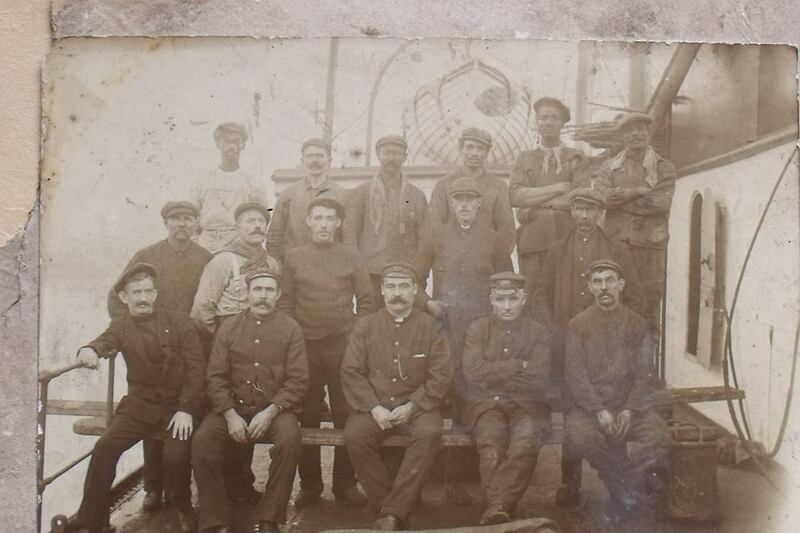 I know there was most likely Waterford men aboard, but don’t know any of the names I’m afraid. Bill Gunnip (RIP) who was our neighbour sailed with the company and did the Duffin family and I know the Heffernans, Hearnes and Walsh’s of Passage East were with the company too. Paddy Roche mentioned in a comment that his Grandfather Jim Roche of Ballyhack was aboard the Willow, but was not sure if it was at the same time. I’ve read recently that Irish ships saved the lives of 521 sailors of all nationalities and neutral Irish ships were attacked (by both sides) 41 times. 149 Irishmen died and 38 were injured, many permanently. *** That does not include those that sailed under other flags. Growing up, my war hero’s were gleamed from comics and movies and tended to be military men who managed against all odds to do the impossible, and usually with a lot of gunfire. But as an adult you see things a little differently. The crews of such ships as the Irish Willow could only turn into danger on hearing an SOS, but that neither diminishes nor fully explains their decision to do so. They could do no other, but that in itself is very often heroic, especially when the sea is involved. * Taken from “The Story of the Dunmore East Lifeboats” Brendan and Mary Glody made a present of a copy of it to me during the week.